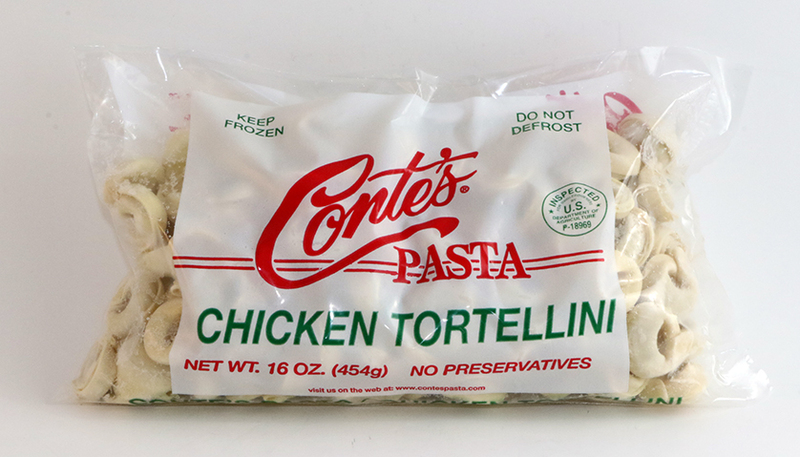 COOKING INSTRUCTIONS: Bring to a boil, gently place frozen Chicken Tortellini into boiling water for 8-10 minutes. Drain well serve with broth or Conte's sauce. DOUGH: ENRICHED DURUM WHEAT FLOUR, (durum wheat flour, niacin, ferrous sulfate, thiamin mononitrate, riboflavin, folic acid), WATER, EGGS, SOYBEAN OIL, TURMERIC. FILLING: COOKED CHICKEN, CRACKER MEAL, (wheat flour, water, salt) CHICKEN BASE (chicken meat, chicken juice, salt, hydrolyzed soy and corn protein, sugar, flavorings, potato flour, autolyzed yeast extracts, carrot powder, turmeric), SALT, BLACK PEPPER, PARSLEY.